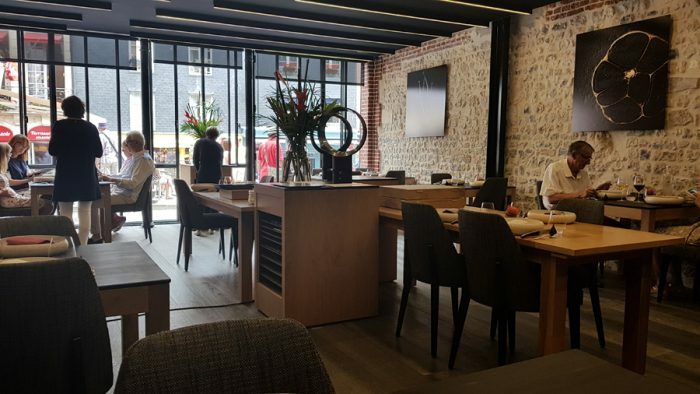 The wonderful city of Honfleur hosts SaQuaNa, a restaurant well known for it’s superior quality of seafood. 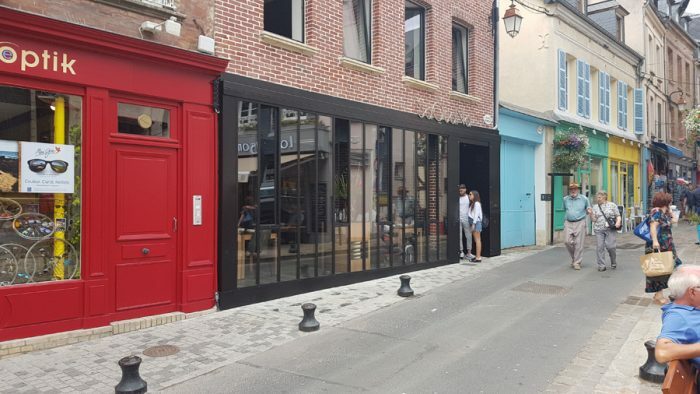 Chef Alexandre Bourdas is said to use only the best ingredients – as the name of his restaurant means taste, quality, nature or fish in Japanese. Reason enough for a lunch! 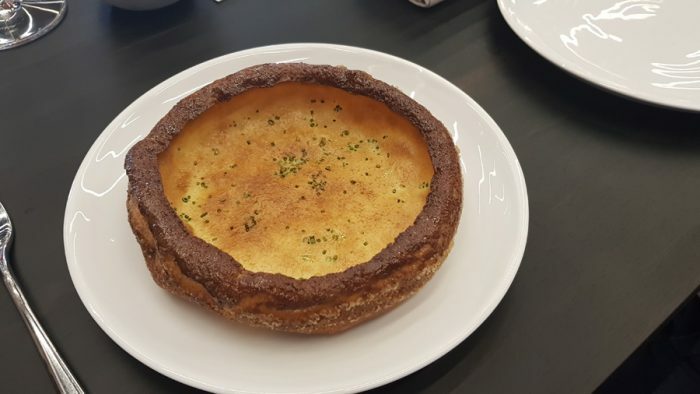 A speciality from the chef’s home…something in between a yorkshire pudding and a pancake. Sweet and savory at the same time and for me personally a weird start into a menu (and besides a giant portion too). 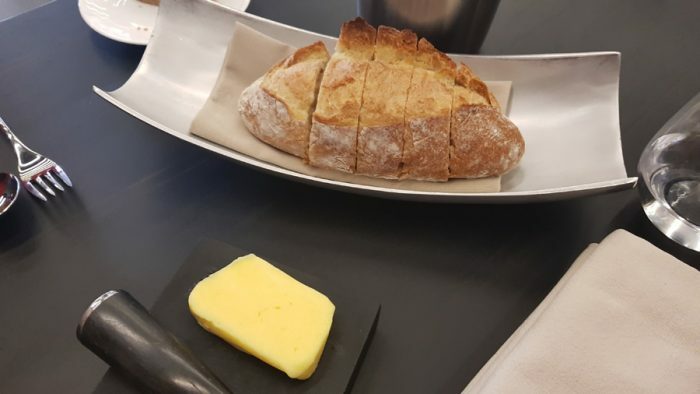 You would expect nothing less in France: Just perfect baguette and wonderful, salted butter. A signature dish of Bourdas. 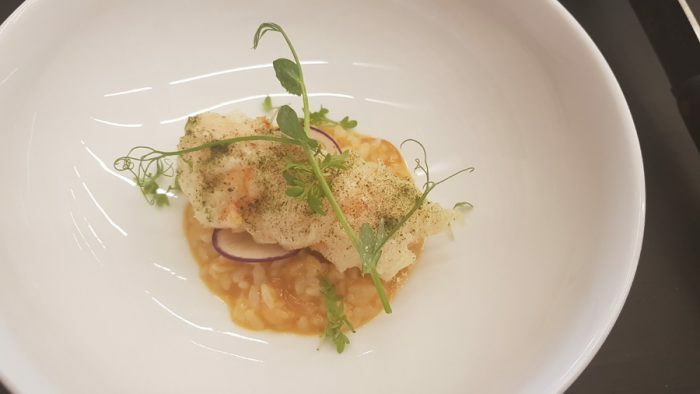 A perfectly fresh and juicy piece of monkfish is brought together with Thai inspired tastes. I loved the light yet very complex broth; it was not too „exotic“ but a perfect eastern inspired stage for a wonderful product. 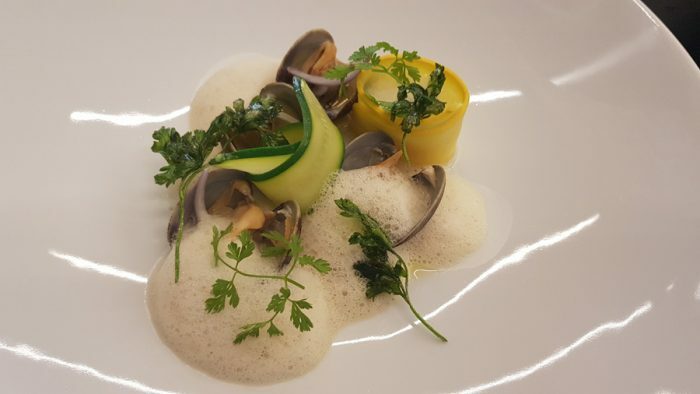 A similiar principle with another great product: The wonderful clams were given an asian twist, while the courgette kind of grounded the whole dish. Very simple, very good. The pieces of excellent salmon (very clean taste) were held together in a comforting and rich cream. The leeks and quinoa gave some structure, the daikon and salmon eggs added freshness. Great composition, very classic. 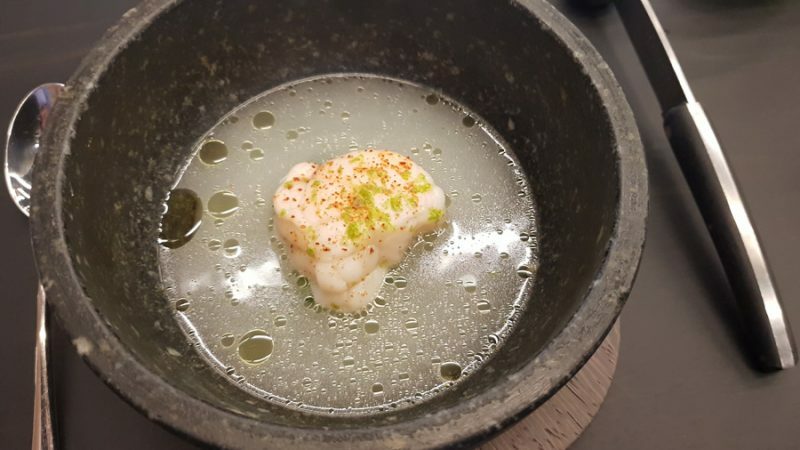 A very classic dish, with an excellent langoustine. The batter could have been a bit lighter and thinner – but was still excellent. The risotto was amazing. A very simplistic looking dish. The beef tasted excellent, but was a bit too chewy for my taste. The intense meat taste paired incredibly well with the other components of the dish though. 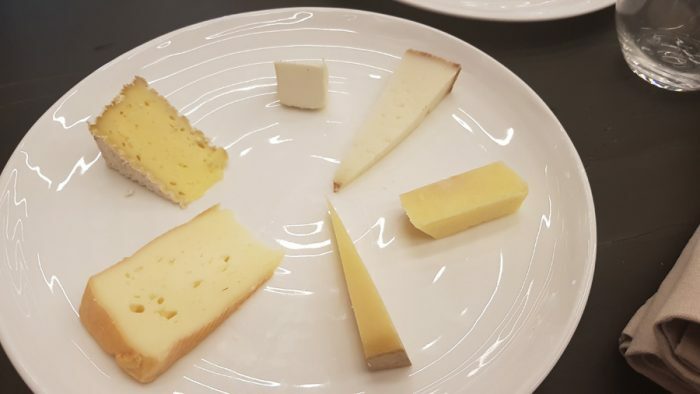 I loved how the thinly shaved components blend into a combination reminding me of a misty morning in the woods, still preserving each single taste. This is a taste, that will stay with me for a very, very long time – when I close my eyes I can still enjoy it like I would still sit there. A part it was served with a excellent, crunchy green salad that was marinated with beef juice – maybe the best „simple“ salad I’ve ever had. 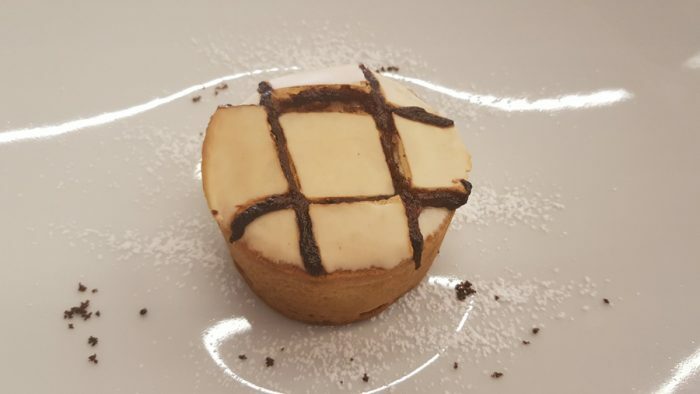 A very classic pastry to enjoy. 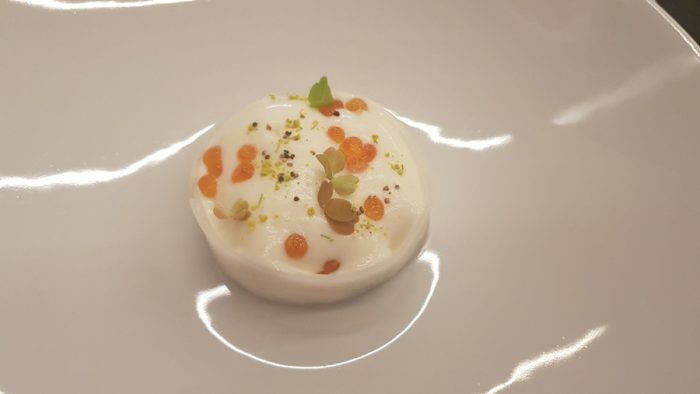 A very delicate and refreshing desert. 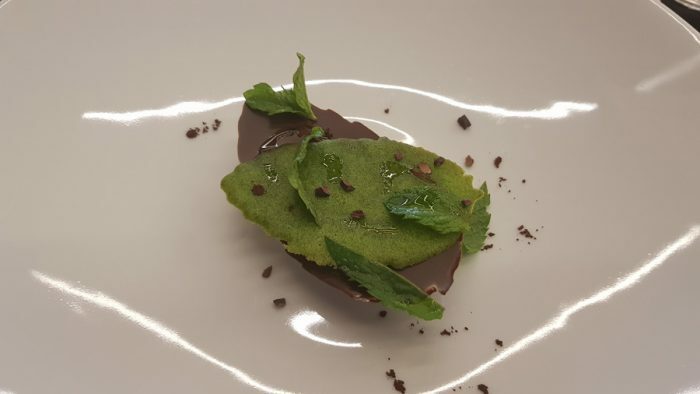 I loved the combination of olive, mint and chocolate, reminding me of After Eight chocolates. 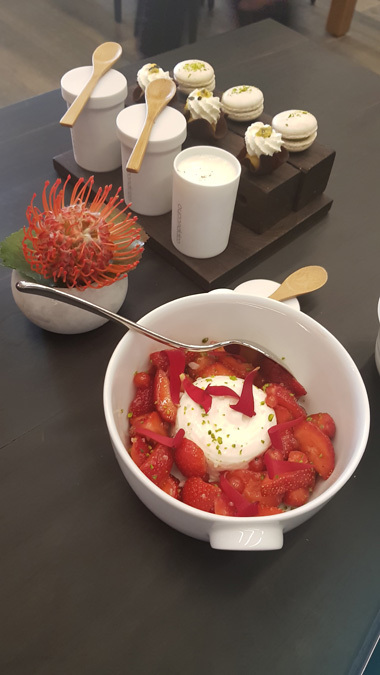 The last desert was in it’s simplicity maybe the best: Seasonal strawberries in flawless quality with heavy cream – just wonderful. In the end an idced cappuchino was accompanied by two petit fours. I really enjoyed our meal at SaQuaNa. The seafood quality was really excellent and I liked the asian-inspired touch on the dishes. 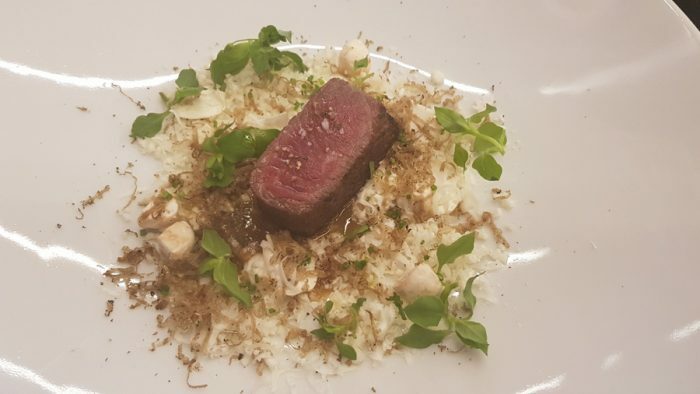 While not all components met my expectations (tempura technique of the langoustine, quality of the beef), monsieur Bourdas for sure knows how to create memorable plates and tastes. My overall impression was very good and I would recommend a visit.